It's no secret, to those close to me, that I am a huge fan of real estate investing. 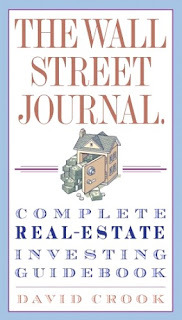 The book of the week was The Wall Street Journal Complete Real-Estate Investing Guidebook by David Crook. I liked this book because it was very informative on a very "real" level. It didn't boast unreal expectations like many real estate books. The methods outlined within this book can take someone with somewhat little knowledge in the field and help them really start making money with investment properties. There was one particularly helpful chart within this book that I would like to tell you about. The chart outlined how to prepare for your starter property. It is broken into 4 categories: 1-3 months, 4-6 months, 7-9 months and 10-12 months. Each time period has tasks to be completed within it... let me show you. I think laying out a plan is especially helpful for anyone just getting off the ground. I love to make plans. I actually have plans for myself that range from month to month and even 10 years in the future. It really helps a person get things in perspective... "what do I have to do here to get there?" Crook also does a great job of directing a portion of his book to novice investors. In his 6th chapter, There's No Place Like Home: Smaller Residential Investment Properties, he explains how to get your cashflow generated with smaller properties. I am a big fan of starting off with a nice duplex. It helps you get a feel for the management environment on a smaller level. I feel that if you are going to have expectations of a property management company, you should understand the field. Additionally, with a duplex you can get a cheap rent (a lot of people think you'll live for free if you have the other side rented, however, when you take in to account the taxes, maintenance, utilities, and insurance you will probably just end up with a much cheaper version of rent.) You will most likely start having a positive cashflow on the second property and then from there... the sky is the limit! Real Estate is a great investment for several reasons, but I want to clear up a misconception that a lot of people have about real estate investing. A lot of people see their personal home as a investment... however it's not. Several of my authors have explained this concept and Crook does and especially great job of making the point clear with an illustration of a the same house on two pages, one being used as a home and one being rented out. The house being used as a home has expenses just like one being rented out, however, when you use the house as your home your expenses (taxes, utilities, interest paid on mortgage, maintenance, upgrades etc.) in the long run outweigh your financial benefits from the sale down the road. People don't include the expenses of running a home into the "investment" of their home. The myth of having a home as an investment has been passed along for years, but when you see the reality you have an opportunity to change that mind set. Put more of your savings into solid investments and riches will be awaiting you. I think this book is a really great read for anyone thinking about getting into their first few real estate deals. The Wall Street Journal books are always very well written and they come with little side modules with helpful little tidbits, which I think is a nice way to break up the book and make it more interesting. I think this book is a great, easy read for anybody, but would be especially helpful for anyone that is or aspires to manage people. I particularly love talking about real estate, so don't hesitate to ask me questions if you have any! I would be more than happy to help anyone that wants it.